Route opportunities from Algiers, Oran. 355,263 Belgium tourists within the Valenciana Comunitat in 2014: route opportunity from Brussels, Brussels Charleroi, Ostende, Liege. 1,058,800 French visitors within Valenciana comunitat in 2015: route opportunities from Paris, Nantes, Marseille. 506,500 German tourists within the Valenciana Comunitat in 2015: route opportunities from Munich, Cologne, Berlin, Bremen, Düsseldorf, Hamburg. 143,000 Irish tourists within the Valenciana Comunitat in 2013: route opportunities from Dublin, Shannon, Cork. 300,000 Italian tourists within the Valenciana Comunitat in 2014: route opportunities from Rome, Milan, Turin, Bologna. .
Strong Moroccan community in Castellon (17,250 individuals): route opportunities from Casablanca, Tangier. 458,959 Dutch tourists within the Valenciana Comunitat in 2015: route opportunities from Amsterdam, Eindhoven. Route opportunities from Warsaw, Krakow, Wroclaw, Katowice, Gdansk. Route opportunities from Porto, Lisbon. Strong Romanian community (51,000 Romanians registered in the Castellón area) route opportunities from Timisoara, Iasi, Cluj-Napoca. 132,000 Russian tourists within the Valenciana Comunitat in 2015: route opportunities from Moscow, St Petersburg, Ekaterinburg, Rostov-on-Don. 653,200 Scandinavian tourists within the Valenciana Comunitat in 2015: route opportunities from Oslo, Stockholm, Copenhagen, Helsinki, Aalborg, Gothenburg, Bergen, Stavanger, Kristiansand. Route opportunities from Madrid, Bilbao, Malaga, Seville, Oviedo, Palma de Mallorca, Ibiza. Two million UK visitors within Valenciana Comunitat in 2014: route opportunities from Birmingham, Manchester, Edinburgh, Glasgow, Leeds Bradford. Route opportunities from Kiev, Ivano Frankovsk, Lviv. 120 kilometres of beaches (awarded with blue flag status). Major music festivals (audience: Arenal sound festival – 260,000 people; Rototom – 250,000 people; FIB – 115,000 people). Wide choice of spas and wellness resorts (400,000 tourists enjoy health & wellness programmes). 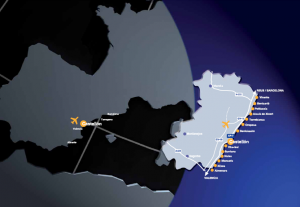 The airport will offer comprehensive marketing support for new routes. The airport opened in September 2015 when Ryanair launched flights from London Stansted and Bristol. 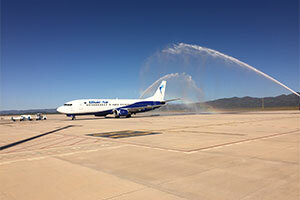 The carrier also links Castellon to Sofia while Blue Air now serves the airport from Bucharest, with both receving marketing support for thier new services. 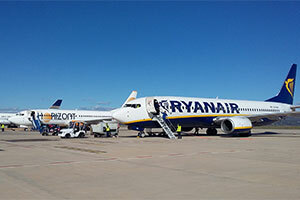 Castellón is the first airport in Spain to be managed by a private company. Incentives on landing and passenger fees (75% discount Year 1 – 50% discount Year 2 – 25% discount Year 3). Comprehensive marketing support for new routes. Free car parking for passengers. City of Castellón – 250,000 inhabitants. Castellón Province – 605,000 inhabitants. 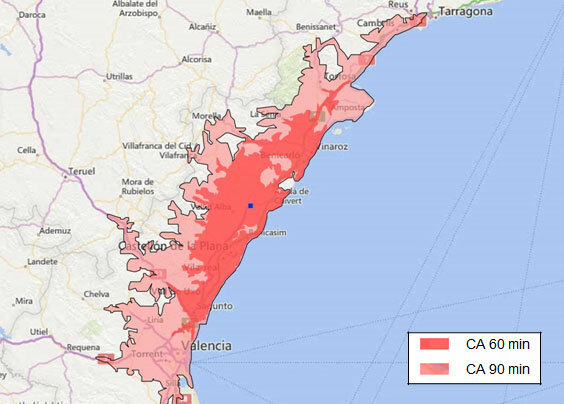 60-min catchment area – 890,000 inhabitants (1,675,000 including Valencia). 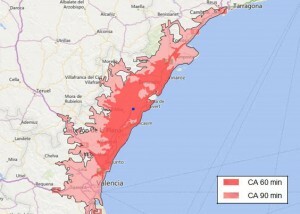 90-min catchment area – 2,307,000 inhabitants (3,093,000 including Valencia). Strong agricultural sector (citrus, kakis, avocados, mangoes, pomegranates, watermelon, cauliflower, cabbage …). Dynamic ceramic sector within Castellón area (Porcelanosa grupo, STN ceramica, Karimex,Keros ceramica, Institut de promocio ceramica …). Abundant space in public and non-public areas. Castellón is the most northerly province of the Valenciana Community, and the second most mountainous in Spain. It offers a coastline with excellent beaches, stretching for more than 120 kilometres, adjacent to a diverse and natural interior which cannot fail to move the visitor. The province of Castellón is a tourist destination whose charms and contrasts can be enjoyed 365 days a year. The airport has eight nose-in stands that are capable of handling aircraft including the 737-800, A320. The airport is also able to handle the A350 and 777. Runway: One (2,700 x 45 metres). Slot co-ordinated: No slot constraints. Operating hours: From Wednesday to Sunday 10:00 – 18:00. The airport may be opened outside these hours upon request submitted by the airline company to the airport management. Terminals: One – 10,500 square metres. Stands: Eight aircraft stands – all nose-in. 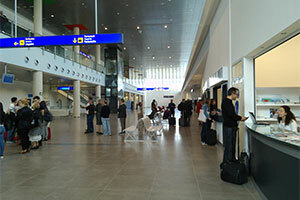 Equipped with completely new infrastructure, the airport can handle up to two million passengers per year. Equipped with completely new infrastructure, Castellón Airport can handle over two million passengers per year. 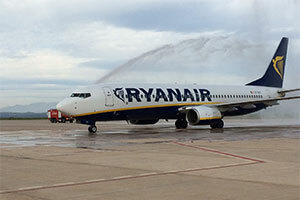 Commenced operations in September 2015 when Ryanair launched flights from London Stansted and Bristol. 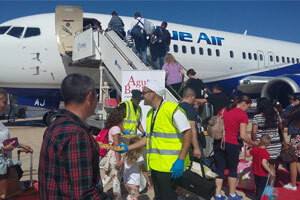 Four routes are now served by Ryanair (Bristol, London Stansted and Sofia) and Blue Air (Bucharest). Largest airlines: Ryanair and Blue Air.